The LWML – Hidden (sort of) Treasures | "Northern Crossings"
Back in the day before there were Smart phones and Twitter and all the communications devices we have today the phone would ring at 3 o’clock in the morning and we would stumble out of bed praying that nothing had happened to our loved ones and we were expecting to hear the worst. We need to get a hold of somebody at such and such a number and of course at 3 o’clock in the morning you can’t find a piece of paper and you’d be lucky to find a pen. But if you did find a pen the handiest thing to write on so that you would not lose an important message was the palm of your hand. God says he has us engraved on the palm of his hand. We are important, he’s not going to forget us, and he’s not going to forget all those souls that Jesus died to save and so he wants us to remember them too. We go out into the world to be his hands and feet so that everyone everywhere will know how much God loves them and what God wants for them. Engraved upon the palm of God‘s hand, and never forgotten, means we are also upheld in those hands and carried by those hands into the story of Jesus Christ whose nail scarred hands and feet and pierced side won for us redemption from sin and death and the devil. For us Lutheran Christians that means that the most important thing in our life is Christ Jesus, his blood bought gift of redemption, and the need to tell others about it among our families, friends, communities, and around the world. Christ has to be the center of everything and his name must be lifted up. From the very beginning of Lutheranism, the Confessors were not concerned about an abstract purity of doctrine; they were not concerned about strange ideas or philosophical opinions about how many angels could dance on the head of a pin; but they were concerned, about a Person; they were concerned about the glory and honor of Christ. They were concerned about lifting high the name of Jesus because God has highly exalted him and given him a name above every other name because of his suffering and death and resurrection for all human beings. It is a wonderful thing to think that right now this week in the North Dakota District and the Minnesota North District, our LWML‘s, Lutheran Women’s Missionary Leagues, women are thinking about these two wonderful propositions. That we and all men and women everywhere are engraved in the palm of God‘s hand, and that our task is to lift high the name of Christ so the people around the world can see and hear of him through the preaching of the Gospel and the acts of mercy that we do. The LWML Minnesota North District Convention will be held June 18-20, 2018 at the Sanford Center in Bemidji, MN. The theme Bible verse is, “See, I have inscribed you on the palms of my hands” (Is. 49:16a NKJV). 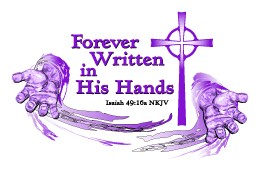 The convention theme is, “Forever Written in His Hands.” They are in the midst of their convention now and we pray God’s blessings. North Dakota LWML District Convention is June 22–24, 2018. Theme: “Lift High the Name of Jesus” Philippians 2: 9–10. I have said before that the LWML is a hidden treasure. They are sometimes ignored by Pastors and some think of them as the funeral luncheon women. The LWML is a dynamic producer of Bible studies and devotions, mission funding and grants. They are in terms of organizations, relatively free of silos and turf wars and beaurocratic inertia. Their conventions are fun and productive and I would invite Pastors who have never been to one to go and observe and women of all ages to join if you haven’t. They are a treasure. PreviousI Got to Call Him Dad. NextNattering Nabobs of Negativism or Caterwauling? These Things Ought Not to Be!